Review by AllTheBestFights.com: 2017-05-06, wild and tough exchanges between Catalin Morosanu and Lukasz Krupadziorow: it gets three stars. The former SuperKombat champion Catalin Morosanu entered this fight with a professional kickboxing record of 43-11-0 (26 knockouts) and he is ranked as the No.12 heavyweight in the world while his opponent, Lukasz Krupadziorow, has an official record of 7-4-0 (5 knockouts). Morosanu lost three out of his last four bouts, against Daniel Sam (=Morosanu vs Sam), Zabit Samedov (=Samedov vs Morosanu) and Ondrej Hutnik but he came back to win against Maurice Greene in 2017 (=Morosanu vs Greene). Catalin Morosanu vs Lukasz Krupadziorow is the main event of SuperKombat WGP 02 2017. Watch the video and rate this fight! Review by AllTheBestFights.com: 2013-03-26, some good exchanges between Catalin Morosanu and Daniel Sam but it is not enough to get three stars: it gets two. The former SuperKombat Hw champion Catalin Morosanu entered this fight with a professional kickboxing record of 42-8-0 (25 knockouts) and he is ranked as the No.11 heavyweight in the world. He suffered his last loss when he faced Tomas Hron in 2014, since then he has won five consecutive bouts beating Maurice Jackson in his last one. His opponent, Daniel Sam, has an official record of 24-12-0 (9 knockouts) and he entered as the No.12 in the same weight class. He fought twice last year defeating Brian Douwes but then he lost to Xavier Vigney (=Sam vs Vigney). Morosanu vs Sam, SuperKombat heavyweight championship eliminator, is the main event of the SuperKombat World Grand Prix I 2016. Watch the video and rate this fight! Review by AllTheBestFights.com: 2015-12-12, some tough exchanges and a spectacular finish: Bogdan Stoica vs Damian Garcia gets three stars. Bogdan Stoica entered this fight with a professional kickboxing record of 44-8-0 (32 knockouts) and he is ranked as the No.11 cruiserweight in the world while his opponent, Damian Garcia, has an official record of 34-10-1 (25 knockouts). Stoica has already fought six times in 2015 losing just his last bout, against Ibrahim El Bouni; before this fight he had won over Patrick Veenstra (=Stoica vs Veenstra). Stoica vs Garcia is on the undercard of Catalin Morosanu vs Maurice Jackson (but we don’t post it because it was a shameful one-star-fight) – SuperKombat In The Cage. Watch the video and rate this fight! Review by AllTheBestFights.com: 2015-11-07, nice and tough exchanges between Andrei Stoica and Jorge Loren: it gets three stars. Andrei Stoica entered this fight with a professional kickboxing record of 40-6-0 (25 knockouts) and he is ranked as the No.7 super cruiserweight in the world. He lost to Danyo Ilunga in 2014 (=Ilunga vs Stoica) but then he has collected eight consecutive victories winning over Pavel Voronin in his last one (=Stoica vs Voronin). His opponent, the former Wako Pro world champion Loren Javier Jorge, has an official record of 79-15-4 (31 knockouts) and he entered as the No.12 in the same weight class but he lost two out of his last three bouts: against Redouan Cairo and Luis Tavares. Stoica vs Loren, main event of Superkombat WGP 2015 Final, is valid for the SuperKombat super cruiserweight title (Stoica’s fourth defense). Watch the video and rate this fight! Review by AllTheBestFights.com: 2015-10-02, tough fight but not so exciting: Andrei Stoica vs Pavel Voronin gets two stars. Andrei Stoica entered this fight with a pro kickboxing record of 39-6-0 (25 knockouts) and he is ranked as the No.7 super cruiserweight in the world while his opponent, Pavel Voronin, has a record of 14-6-1 (9 knockouts). Stoica lost to Danyo Ilunga in 2014 (=Ilunga vs Stoica) but then he has collected seven consecutive victories winning over Fred Sikking in his last one (=Stoica vs Sikking). Stoica vs Voronin is on the undercard of Catalin Morosanu vs Tomasz Czerwinski. Watch the video and rate this fight! Review by AllTheBestFights.com: 2015-08-01, nice and tough fight between Bogdan Stoica and Fabio Kwasi: it gets three stars. The former SuperKombat cruiserweight champion Bogdan Stoica entered this fight with a pro kickboxing record of 42-7-0 (32 KOs=76%) and he is ranked as the No.9 cruiserweight in the world while his opponent, Fabio Kwasi, has an official record of 28-2-0 (15 knockouts). Stoica has already fought three times in 2015 beating Horace Martin in his last one (=Stoica vs Martin). 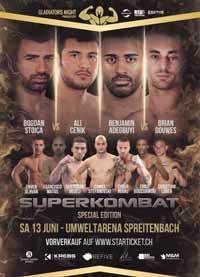 Stoica vs Kwasi is on the undercard of Andrei Stoica vs Fred Sikking – SuperKombat WGP 4. Watch the video and rate this fight! Review by AllTheBestFights.com: 2015-08-01, disappointing fight between Andrei Stoica and Fred Sikking: it gets two stars. Andrei Stoica entered this fight with a professional kickboxing record of 38-6-0 (24 knockouts) and he is ranked as the No.8 super cruiserweight in the world while his opponent, Fred Sikking, has an official record of 45-19-1 and he entered as the No.14 in the same weight class. Stoica suffered his last defeat in 2014 when he faced Danyo Ilunga (=Ilunga vs Stoica), after this bout he has won six fights beating Abdarhmane Coulibaly in his last one (=Stoica vs Coulibaly). Stoica vs Sikking, main event of SuperKombat WGP 4, is valid for the SuperKombat super cruiserweight title (Stoica’s third defense). Watch the video and rate this fight!